What do you prefer? Breast or Thighs? I’m a thighs one and finding new ways to cook them is always so welcome. This Sweet and Sour Chicken recipe is delicious! Give it a try Foodies :D. In no time and no effort you will have such a different and lovely way to eat your chicken thighs. Rosemary is one of my favourite herbs and I have some in my terrace growing in a big pot, this is why I will send the recipe to Grow Your Own, this month the event is hosted by Zora from Gardenopolis. This event is the brainchild of Andrea from Andrea’s Recipes. I know I’m not visiting you all as I should… I’m going through some sweet and sour life times now. Hopefully everything will be alright soon :D.
Ingredients for 4 servings: 8 chicken thighs, 1 big onion, 2 honey tablespoons, 2 tablespoons of orange sweet and sour marmalade, 1 spring of fresh rosemary, olive oil, salt and black ground pepper. Clean the chicken under tap water. Dry. Add some salt and pepper. Place in an oven recipient with a bit of olive oil and have in the oven for 45 to 60 minutes at 180ºC. Meanwhile, get a frying pan with some olive oil (2 tablespoons) and add the chopped onion. Cook at low heat for 20 to 30 minutes with the rosemary too. Add some salt and pepper and pour the honey and the orange marmalade. Stir until you get a thick sauce. When there's only 5 minutes left for the chicken thighs to be done, pour the sauce over them. After 5 minutes turn them and let them cook another 5 minutes. Turn heat off. Take off the oven and let rest for another 5 minutes. I’m a thighs person too, and these look fantastic! I love chicken dishes with fruity ingredients. I hope everything works out okay for you very soon, Nuria. I hope everything is well with you my friend and we’ll wait patiently for you :) I am also a thigh lover (lol that didn’t sound good) and this is something I’d love to try. I’m a breast woman myself but am not adverse to having some dark meat too:D The sauce sounds wonderful Nuria!!!! This looks lovely, Nuria. I have a favorite chicken recipe coming up on Wednesday, too. I hope things get much easier for you soon! I hope everything is okay with you and your family. 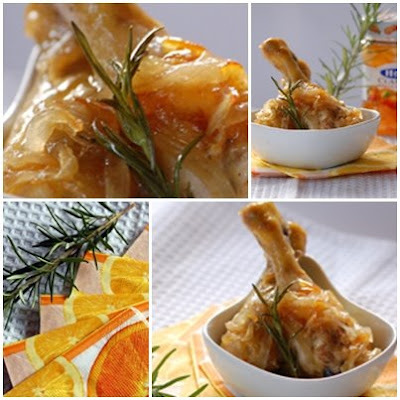 The sweet and sour chicken sounds delicous and although I am also a thigh lover, there are some recipes which I prefer the breast. These look beautiful, Núria. 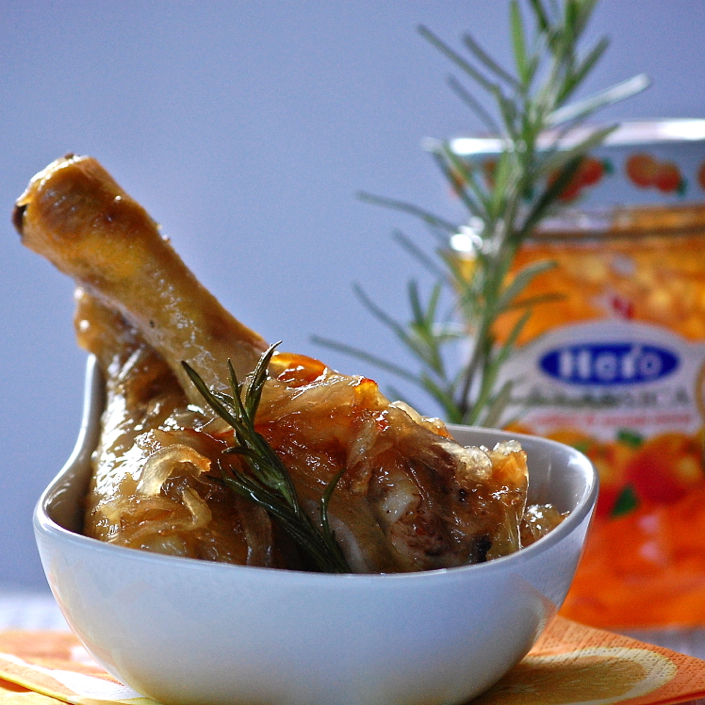 I’m a big fan of thighs too – they’re so much more flavourful. Dear friends, thank you all for your kind words and concern!!! You are so nice to me :D. I might explain what’s going on in a future post. Thanks! Upps! As you probably all guessed… I meant bitter instead of sour… :( Sorry!!!!!! Life is definitely sweet and sour … we just need to remember to take things one day at a time. Last night I made a sweet and sour dish too–I was actually hoping to submit it to the Tapas event but it didn’t turn out exactly as I’d hoped so I will be trying it a bit differently this weekend. The chicken with the marmalade sounds delicious. Love the rosemary with the citrus. 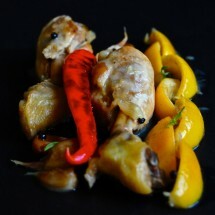 Hi, Núria… Love the recipe and the delicious pict! I love thighs, drummets and the sot-l’y-laisse aka solilesse. In the meantime… when the going gets tough, the tough gets going, Núria. It’s part and parcels of our lives :-) We want to see you smile and be yourself again, ok? Take it easy and we’ll be there to lend our ears…LOL… I mean eyes :-) Looking forward to more entries from you! Espero que los tiempos dificiles pasen pronto, Nuria. Animos arriba y seimpre a seguir adelante! Hi sweetie, I hope everything is OK. Sending lots of hugs! These chicken thighs look really good! I am going to have to try them. 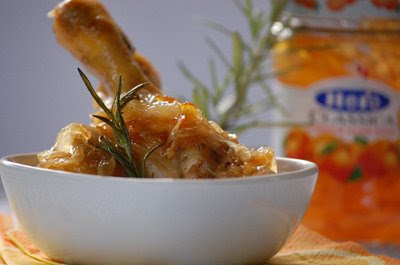 This is a fabulous preparation for chicken thighs, love the sweet and sour flavors and rosemary. Hope you are doing well. That looks delicious! A wonderful flavor combo! Nuria, I’m a leg & thigh man myself but much like women…I like all parts of the chicken…sweet & sour as well! Do what you have to do with your life…I’ll still be here. I like rosermary too, your chicken look delicious !!! i love rosemary, too! i have a friend that grows it and i do drive-bys and take some! i really enjoy using it rabo encendido!!! que rico! espero que estes bien! This sounds delicious as always, Nuria. Hope everything is ok with you! This looks so sticky and delicious! And easy! Thanks for sharing again with Grow Your Own! 06/23/2009 · 11:44 h by tobias cooks! this is certainly on my todo list. I love the combination of flavours you are presenting here. very nice! Hope everything turned out OK with your challenge. I was made this sweet and sour chicken for dinner tonight, and it was delicious! I was a little nervous it wouldn’t have enough depth of flavor, but it turned out scrumptious. even my hubby was loved eating this…as long as he can use his fingers. thank you for shearing your post. Hey Rumela! Thank you so much for telling me about it! I’m so glad you enjoyed it :D.
Oh My Gosh . ! Esto es increíble ! El sabor dulce del esmalte en el pollo . Otra cosa la textura maravillosa el pollo tiene en él . Me encanta. Congratulations Mr OBAMA! A Sweet Dessert for a Sweet Victory! Sweet and Sour Swordfish and a 2nd place in the Joust!